Henschel & Son Tiger I Heavy Tank | The Fighting 1:18th! 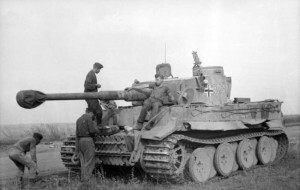 The Tiger tank is one of the, if not the, most recognizable German tanks from World War II. The Tiger may also be one of the most coveted pieces of armor by 1:18 World War II collectors aside from the extremely hard to find Panzer IV. But unlike the Panzer IV, 21st Century didn’t hold anything back on the Tiger. This is one of the best pieces of armor created by any company, from any era, to date. The Tiger I was a German heavy tank used in World War II, produced from late 1942 as an answer to the challenge of facing the unexpectedly formidable Soviet armor encountered in the initial months of Operation Barbarossa. The Tiger I design gave the Wehrmacht its first main battle tank that was capable of using its most formidable piece of ordnance, the 88 mm gun, which had previously showed its convincing effectiveness against both aircraft and other tanks. The tank was given its nickname Tiger by designer Ferdinand Porsche, and the Roman numeral was added after the later Tiger II entered production. The initial official German designation was Panzerkampfwagen VI Ausführung H (‘Panzer VI version H’, abbreviated PzKpfw VI Ausf. H), but the tank was redesignated as PzKpfw VI Ausf. E in March 1943. The tank also had the ordnance inventory designation SdKfz 181. This particular version of the 21st Century Toys Tiger I Tank is from the sPzAbt. 502, as indicated by the mammoth marking on the tank’s forward hull. The sPzAbt. 502 saw all of its action on the Eastern Front between May 1942 and May 1945. The battalion did not see much success at any point during the war and struggled for most of its existence. 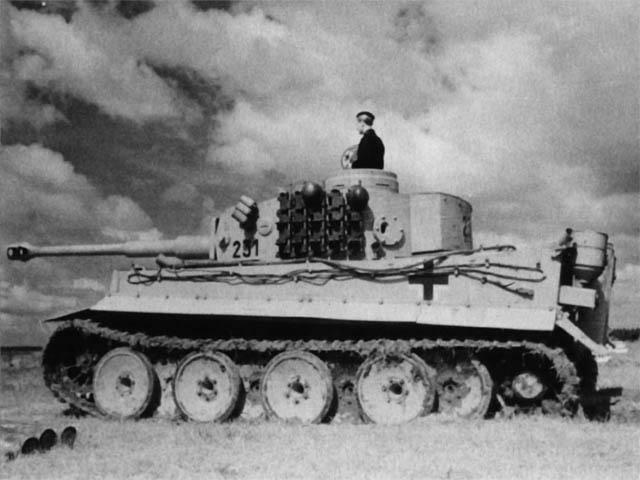 The 502nd were the first panzer company to receive the Tiger Tank as it was designed to counter the heavy Russian armor. A hasty deployment, mechanical problems, and poor terrain conditions contributed to the overall failure of the Tiger Tank in this theater of operations. 21st’s Tiger is a “Fankentank” combining the road wheels of a late-production Tiger with the double-hole sights in the barrel mantlet of an earlier production piece. Gotta agree with the assesment of the tank driver. The later version in panzerkombi was much better, but he comes with permanently attached binoculars and no Luger P08. 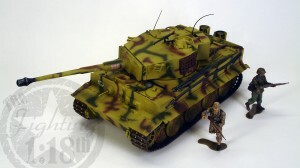 Pingback: Henschel & Son Tiger I Heavy Tank | The Fighting 1:18th!